There are more than a few ways you can improve the fuel economy of your diesel truck. Upgrading your fuel injectors or replacing your worn turbocharger will have a great impact on your fuel economy but there’s more to your truck than its parts. There’s how you drive it. Here are five much simpler ways to improve your fuel economy. 1. Never let your truck idle. The more your truck is running the more fuel you are wasting. It is important to turn the truck off completely when you are not driving it. Sometimes it seems like it is more efficient to leave the truck running for a few minutes, rather than turning it off then having to turn it back on again. This is actually false; it does not take as much fuel to start your truck as it does to leave it idle. The only time you should leave your truck idle is after a long heavy haul to let your truck cool down. 2. Keep the trailer as close as possible to the truck. The gap between the truck and the trailer should be reduced as much as possible. The reduction will lessen the pull on the truck and in turn minimize the amount of fuel used. The larger the gap between the tractor and the trailer, the more work the engine will have to do causing more fuel to be wasted. 3. Lay off the throttle pedal and gradually accelerate. There is no need to rev up your engine before the truck switches gears. This will just lead to a costly waste of fuel. The faster you accelerate the more fuel you are wasting. Accelerating at a constant rate will greatly improve your fuel economy. 4. Cruise control is not as efficient as you are. Although cruise control is very convenient while driving long routes, it doesn’t know when you are approaching a hill or when there is traffic ahead. When driving the truck yourself you will have more control of when you want to lay off the throttle. For example, when you are at the top of the hill you can ride the hill without extra acceleration to save fuel. 5. Only brake when needed. Staying a few miles per hour under the speed limit will prevent having to slow down for other vehicles, and will especially help because you will not be constantly accelerating and decelerating. So laying off of the throttle sooner and coasting to a stop is much more fuel efficient than accelerating and stomping on the brakes. Keep in mind that gravity is your friend. When you are at the top of the hill let the gravity carry the truck down the hill and part way up the other side rather than wasting your fuel. So if you are trying to improve your fuel economy without busting your bank account, try these 5 easy strategies. However, if you want to vastly improve your fuel economy upgrade your fuel injectors or replace your worn turbocharger on your truck to see the best results. 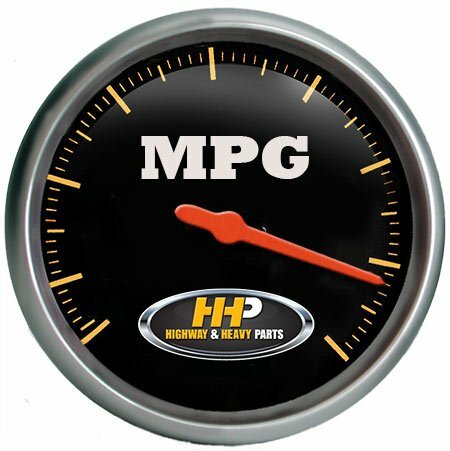 Browse our website to find a product that can best improve your fuel economy.